DISCOVERY: Lost Egyptian Pyramids Found...Using Google Maps? How's this for cool? Researchers may have found 2 new pyramids in Egypt, according to Discovery News. But they didn't find them through an archaeological dig, like you might expect. Instead, they found them using Google Earth. Over the past decade, Google Earth's satellites have been busy snapping pictures of the earth's surface from space. It turns out that man-made structures are very noticeable from the sky. They tend to have straight lines, not normally found in the natural world. Even something thousands of years old can leave a "fingerprint" on the world's surface. Knowing this, archaeologists combed Google Earth imagery for anomalies--things that don't belong. Turns out they may have hit pay dirt. Discovery of 4 mounds and 1 triangular plateau. The first site is around 12 miles from the city of Abu Sidhum on the Nile. 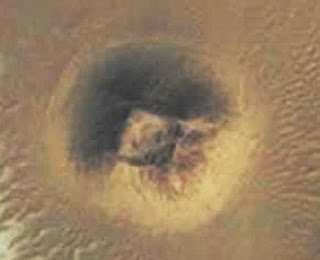 It has 4 large mounds. 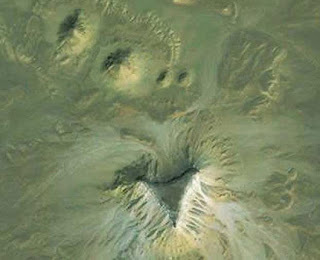 It also has a very large triangle-shaped plateau. You can see the 4 mounds and triangular plateau in this photo, pictured right. Just for visual context, the sun is shining from the photo's lower right corner. You can see two larger cones sticking up, with two smaller cones next to them, and then the big triangle sticking up at the bottom. Micol has done satellite archaeological research for over a decade, using Google Earth as her primary tool. So, just think. The next time you're browsing around Google Earth, you never know . . . maybe you'll discover some long lost treasure. If not, it's always cool to check out how your house looks from space.